Following a low carbohydrate diet doesn’t mean you have to miss out on chocolate treats at Easter. 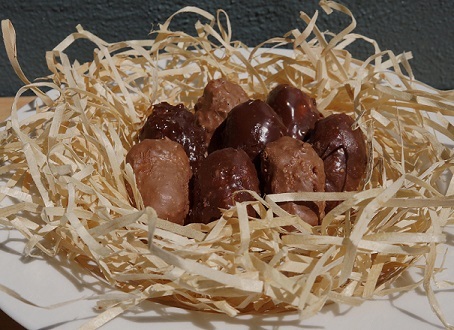 In the first of two free recipes from Atkins, you can make these Low Carb Chocolate coated coconut Easter eggs. Makes 8 eggs, 1.5 grams of carbohydrates per egg. Using your hands, squeeze a teaspoon amount of mixture in your palm a few times until you can mould it into an egg-like shape. Continue with the rest of the mixture, making approximately 8 mini eggs. Place the coconut eggs in the refrigerator for 20 minutes, or until firm. Using two forks, roll each coconut egg in the chocolate until covered. Let additional chocolate drip from each egg back into the bowl. Place the eggs onto a tray with baking paper and chill in the fridge until chocolate has hardened. Store in the fridge. Scientifically formulated for safe weight loss, management and lifelong eating, New Atkins is an easy to follow, flexible four-phased program (start at the phase that best suits you) that helps you build a diet around whole foods rich in vitamins and ‘good carbohydrates’ including low sugar fruits, leafy green vegetables, whole grains, nuts, legumes, dairy, good fats, and protein (fish, poultry, red meat and tofu) – while at the same time helping you eliminate ‘bad’, highly processed carbs such as white flour and sugar.